In 2011, the VocalEssence Ensemble Singers criss-crossed Minnesota via historic Highway 23 to share with the state’s citizens the music of its choral composers, its singer-songwriters and the songs being sung by the people who have made Minnesota their home over the past 150 years. Enjoy the voices of VocalEssence as they explore the state’s unique legacy of traditional, choral and popular song…all the way from “The Songs of Our Grandparents” to “The North Star Hit Parade”! Looking for the ideal gift for the fiercely proud Minnesotan? Perhaps a smorgasbord of the state’s many musical treasures would be the ticket. Well, VocalEssence is here to help. 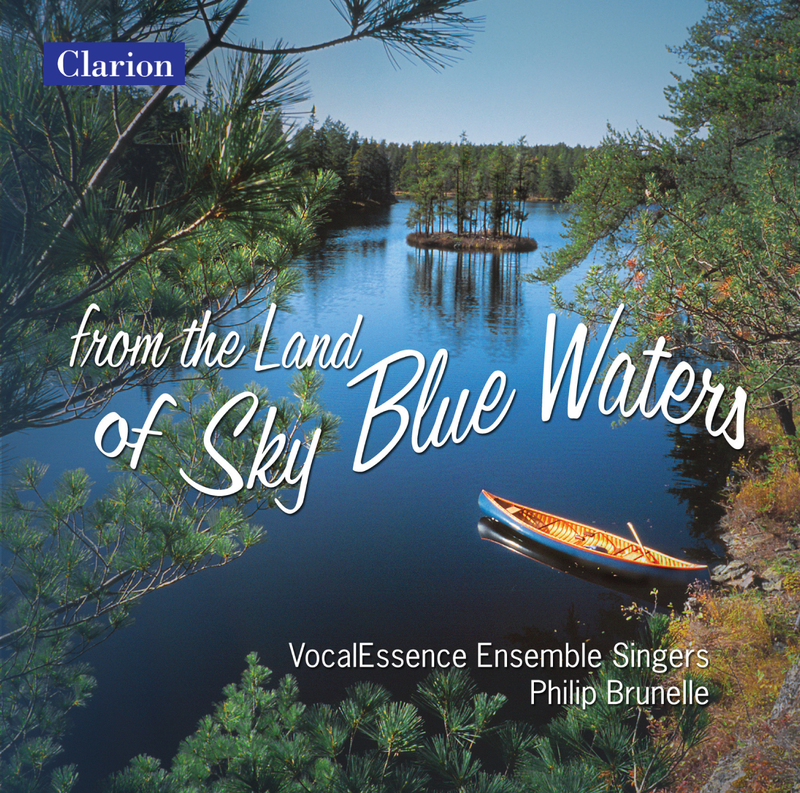 The state’s foremost choral ambassadors have just released a CD that lends their lush, full-voiced sound to an expansive variety of Minnesota-made music. It’s called “From the Land of Sky Blue Waters,” and features works by many of the state’s most prominent composers – like Dominick Argento, Libby Larsen and Stephen Paulus – but also medleys that offer nods to such Gopher State products as Judy Garland, Bob Dylan, Prince, Owl City and Semisonic. And in case the title makes you wonder: Yes, it does have that Hamm’s Beer jingle of the 1960s. Minnesota’s musical heritage defies easy categories or glib summary. So many social and ethnic groups have been instrumental in the founding and development of the state that laying out a quintessential musical history could tire an audience. How should one sum up a whole state, from farm to woodlands, from Native Americans to recent immigrants, from imported folk songs to popular music? This embarrassment of musical riches has required VocalEssence and its leaders to devise two medleys to pay homage to the North Star State’s wealth of music. In Songs of Our Grandparents, the emphasis has fallen on reconstructing the musical world of Minnesota’s preceding generations. One can spy the mighty voyageurs, French-Canadians and Métis, which traversed the area that later became Minnesota, syncopating their oar strokes with traditional tunes like Envoyons de l’Avant. On the other hand, songs like Uncle Sam’s Farm and The Battle Hymn of the Republic give sound to the creation of the state itself. The Hutchinson Family Singers, who lent their name to their own town in Minnesota, were in many ways the first popular American musical group; their own original songs (like Uncle Sam’s Farm) and songs they helped popularize (like Battle Hymn of the Republic) sounded out the Yankee optimism and reformer’s idealism that pushed for Minnesota Statehood in 1858 and galvanized the young state in the fire of the U.S. Civil War — the first state to offer troops to the Union cause in 1861, including the storied First Minnesota Volunteer Regiment. At the same time, songs like The Ballad of Oleana, Die Lorelei, and Hälsa dem där hemma showed how life on the frontier could be challenging, particularly for immigrants. Hope and pride for the future could mix with profound uncertainty, hardship, and longing for homelands. It also became a way for immigrants to make their own impressions on their adopted state. Polka music popularized by acts like Whoopee John Wilfahrt (In Heaven There is No Beer) emerged from distinct ethnic polka styles found throughout Minnesota, while Norwegian-American composer F. Melius Christiansen (Beautiful Savior) helped earn Minnesota a reputation for choral and sacred music. The Andrews Sisters, daughters of a Greek immigrant, gained fame with Bei Mir Bist Du Schoen, itself written by a Jewish composer in German and Yiddish. These tangled immigrant roots, so familiar to our grandparents, fleshed out Minnesota’s grand musical reputation as well as its cosmopolitan sensibility. Minnesota’s musical notoriety did not stop with “our grandparents,” but only grew after World War II to form something of aNorth Star Hit Parade. Popular Minnesota acts like Judy Garland (Somewhere Over the Rainbow) and The Merry Macs (Sentimental Journey) gained international notoriety during the war years and beyond. But the state’s musical icons were a diverse crowd. Saint Cloud’s own Bobby Vee, for instance, became a popular representative of the carefree youth culture of the 1960s with songs like Take Good Care of My Baby, but Hibbing’s Robert Zimmerman, a.k.a. Bob Dylan, became a spokesperson for a whole generation with his socially conscious music with songs like Blowin’ in the Wind. During the 1950s and 1960s, Minnesota also gained attention from the new medium of television and numerous catchy jingles for homegrown companies: the Jolly Green Giant theme, the Hamm’s Beer theme (From the Land of Sky Blue Waters) and even Monty Python’s spoof jingle, The SPAM Song. Its opening credits filmed in downtown Minneapolis, the theme from the Mary Tyler Moore Show has justifiably become a cultural touchstone for the Twin Cities; but few people know that the quintessential disco song Funky Town was recorded here by Minneapolis group Lipps, Inc. The music scene in the Twin Cities has historically been prolific, including rockers like the Replacements and Husker Du, producers Jimmy Jam and Terry Lewis, R&B groups like Morris Day and the Tyme, rappers like Atmosphere and Brother Ali, Semisonic (Closing Time), and Owatonna’s electronic whiz Owl City (Fireflies). Then again, no one could overshadow Prince. His Purple Rain — the song, album, and movie — defined the Twin Cities musically for a generation and continues to do so. Still, other timeless institutions continue to inspire Minnesotans with their music. For instance, Ann Reed’s The Fair captures something very special about the state fair, while the Minnesota Rouser can still make the state hop to its feet at college sporting events. In view of this legacy, the North Star Hit Parade will certainly continue for a long time to come. Franz Young is currently finishing his graduate degree in history at the University of Minnesota, instructing at Metropolitan State, and working at Fort Snelling, a historic Minnesota landmark.